"This book is edited and designed by the editorial committee of Cultural China series"--Title page verso. 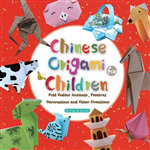 Twenty-four origami projects with Chinese themes. Packed with an amazing number of wilderness shelters-plus a huge number of step-by-step photos for each-this book is the most complete guide to construct sturdy, life-saving shelters from the natural material available in any circumstance.